Would you like to share the love of your pet with others?!?! 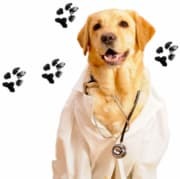 We invite you and your pet to become Paw Pals and visit our patients. Pets provide friendship and show unconditional love to our hospice patients. Your visits leave behind memories of you and your pet, and rekindle thoughts of other pets. All kinds of pets are invited to join VITAS' Paw Pals Club! Visit patient's at homes, nursing homes, assisted living facilities or personal care homes. Rabies and other vaccinations are required. Must pass a pet screening with Volunteer Manager.